Description: Spain and Portugal. Early woodcut after Ptolemy. Description: Spain and Portugal. 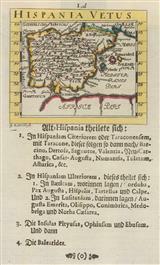 Early woodcut depicting the change of the Iberian Peninsula from the Ptolemaic projection. 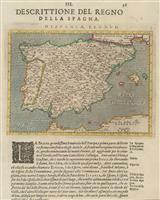 Description: Important woodcut map of the Iberian Peninsula from Munster's highly influential geographical work. Description: Spain and Portugal. Cartouche. Original colour. Description: Spain and Portugal. Coloured. Description: Early 17th century map the Iberian Peninsula embellished with a ship and including the Balearics. Coloured. Description: Spain and Portugal. Decorative cartouche and Coat of Arms. Coloured. Description: Spain and Portugal. Decorative cartouche. Coloured. 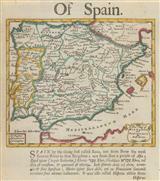 Description: Striking map with an illustrated cartouche of the Iberian Peninsula in original colour. Description: Spain. Attractive early map. Coloured. Description: Iberian Peninsula. Large cartouche lower right. Vignette of cavorting mer people. Original colour. Description: Spain and Portugal. German text. Coloured. Description: The Iberian Peninsula with modern and classical nomenclature. Coloured.